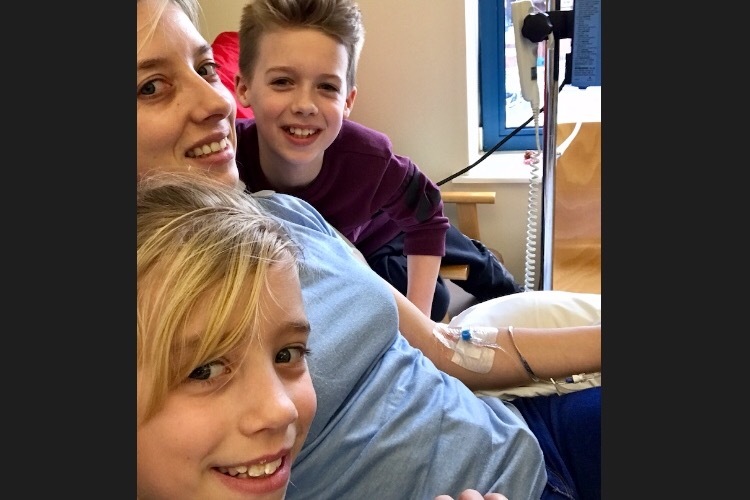 "I must now fundraise for my own life and for my babies to have the mummy they so desperately need and deserve. I am in constant pain in my neck, head and spine and week in, week out my neurological damage is becoming harder to ignore." 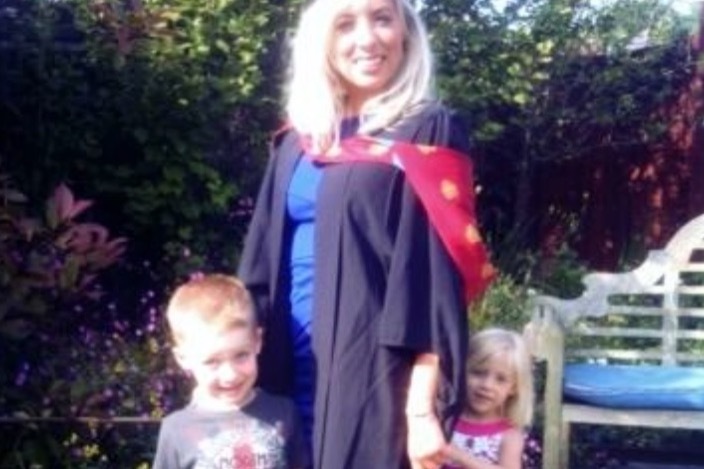 31y/o Samantha is a single mum and Psychotherapist from Gtr.Manchester. She has a connective tissue disorder called Ehlers Danlos Syndrome (EDS-Type1). Connective tissues hold the body and its organs together, but faulty connective tissues cause complications, pain and multiple daily dislocations throughout the whole body. Her spine is collapsing and dislocating, due to the EDS and she requires her FOURTH life saving and life changing Neuro-surgery in America. Let’s get Samantha back to what she does best; Her career helping others and more importantly, back to the fun-loving mummy that her young children so very much miss & deserve. 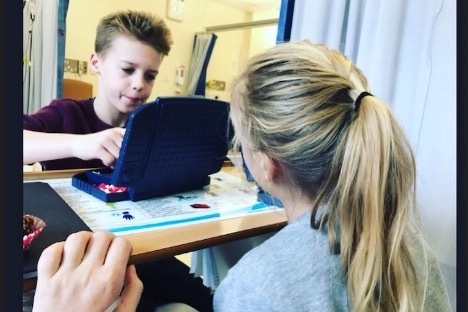 In 2017, Samantha became very unwell very fast and Neuro-surgeons discovered that the weight of her skull was causing her spine to collapse due to the tissue weakness. She lost her private psychotherapy clinic that she had worked hard to build and became bed ridden. Damage to her brain stem and spinal cord caused intermittent paralysis; She became wheelchair dependant & unable to be upright without agonising pain, and memory loss. She was at risk of internal decapitation. There were 3 surgeons worldwide able to complete the surgery she desperately needed in America. #SaveSamantha fundraising was a great success and Sam underwent 3 lifesaving surgeries in August and September 2017. She learned to walk again, and researched and rehabilitated herself- due to no NHS assistance available for EDS patients with her condition in the U.K. Recently, Samantha’s health has declined. 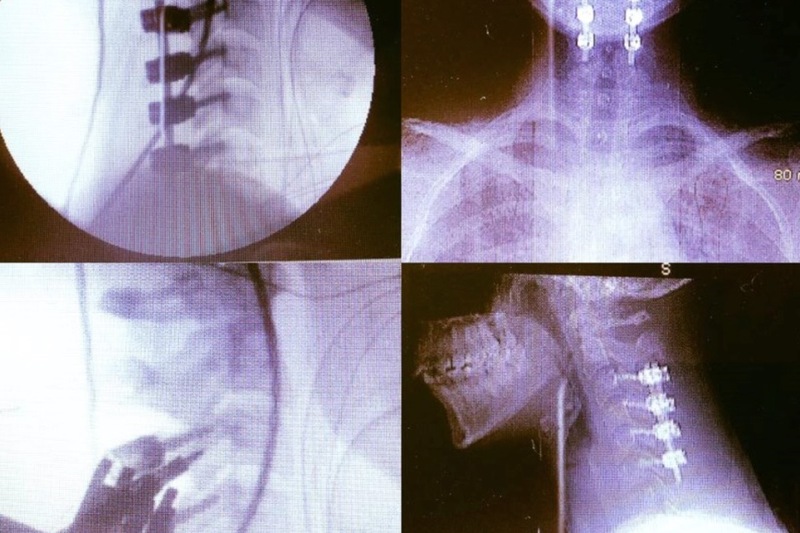 She was devastated to learn that her spine is more unstable than surgeons originally believed and the flexible scaffolding used to fuse her spine in 2017 (pic above) was not aggressive enough to keep her safe. 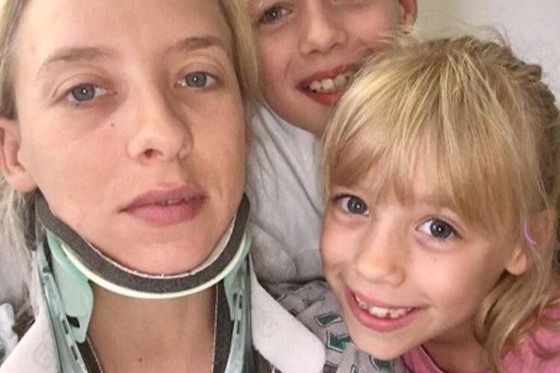 Her body was one of the rare few to reject the bone marrow graft and her spine is still dangerously unstable causing scary symptoms to reappear including damage to her heart, memory, pain and movement disorders and multiple dislocations of the neck and vertebrae each day. Samantha is no longer independent and will face paralysis, organ failure and eventual death without a more aggressive, time critical neuro-surgery in the US. Her children desperately need their mummy back. Please help give Samantha the chance she’s bravely fought so hard for. Help #SaveSamantha to raise awareness and funds in excess of £100,000 for life-saving neurosurgeries surgeries. Myself and my family wish you all a very special Christmas making happy memories with you’re loved ones. Thankyou all for your support so far this year. Today’s been a difficult day; naturally ... I think Christmas is for many. As a therapist, I found many clients struggled more this time of year.... but knowing that it could be our last has brought a downfall of emotional upon me and my family. ... so I feel particularly upset & frustrated at myself for not lasting longer than a couple of hours before crashing with pain & exhaustion. Precious time ‘wasted’. Shares help so much when people are unable to donate at this time of year. We have 3.5 weeks to raise the rest of the pre-surgical costs. We’ve raised £160,000 on various platforms; and we need £20,000 by the second week in Jan to secure my surgeries on the 25th Jan. The remaining £70,000 can be paid post surgery. Our goal right now is that’s £20,000 which will secure the surgery and save my life. The rest is a debt which must be pain to guarantee my post-op tests & consultations. Yesterday and today I’ve had long days in hospital... today Jensen & Brooke joined me on their 1st day of the school Christmas holidays. I haven’t been able to protect their innocence and little hearts from the evils of our reality this last 16 months ... so we’ve found ways to accept what we can’t change and fight for what we can. To have the lifesaving surgeries I need in Arizona- we must raise another £100,000 on top of the £160,000 we’ve raised so far. That means trading our privacy during our most horrific time for media coverage... social media awareness...fundraising events.... vulnerability in the hope that people near & far will donate and keep us together. For my children this means brutal playground questions from their peers, traumatising experiences, and a constant, unforgiving, relentless fear of losing me.... The only parent they recall ever living with. “What will happen with us if you die’? I can’t protect them from this. I can only make everything with my control as memorable and love-filled as can be. Was I right in allowing them to have hopeful, excited thoughts? Was I being selfish? Should I prepare them for the worst or allow them to keep hope? Did I answer their questions right? There’s no training for this kind of thing. I can only try to help them feel reassured and secure; Let them speak openly to me about anything they need.... try to help their brave little minds whirling away. Please.... please help me take this fear away. Please help by donating or sharing my cause. There’s an answer for me. but with only FOUR weeks to raise the funds, fear is weighing heavily on our hearts. Donations via JustGiving - you must contact the campaign organizer for this information. Or this PayPal link - you must contact the campaign organizer for this information. We’re eternally grateful to every single one of you for supporting and helping us fight on through this horrific time. I pray 2019 brings a renewed life for us together. Please do continue to share my cause and to follow my social media pages (above). 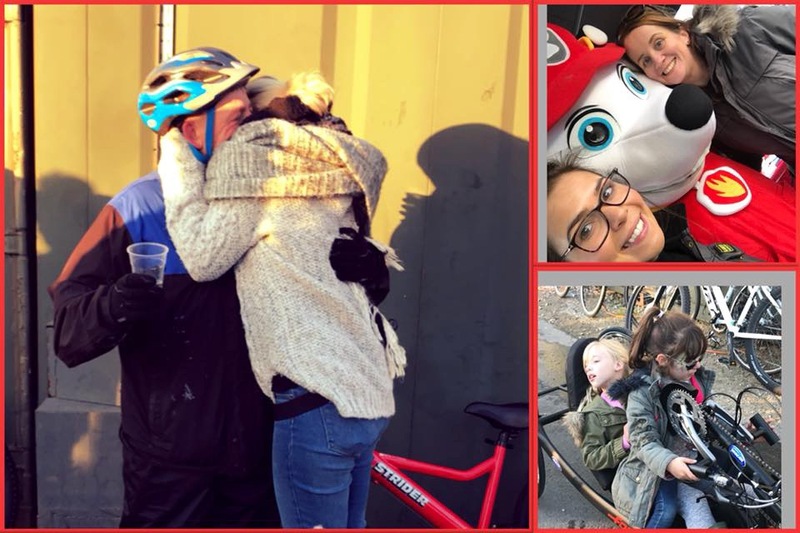 On Sunday Samantha's Dad Phil impressively hand cycled 120km the same distance as Manchester to York at a family fun day to raise money for his Daughter Samantha. Phil has his own mobility issues and arthritis so this wasn't an easy challenge he set himself. Supported throughout the day by family, friends and Save Samantha supporters he was cheered over the finish line with lots of love. He said to the Rochdale Online: “I underestimated how hard it would be, but it wouldn’t be a challenge if it wasn’t. We had lots of local support from businesses including a bouncy castle and face paint for the children, food, drinks, clothes, massage and many more stalls. Samantha attended the family fun day and supported her Dad alongside her Mum, siblings and her own children. It was lovely to see Samantha at the event, full of smiles and hugs for those supporting. However, those closest to her know that each public appearance has hidden pains and that it will take days of recovery. After the event Samantha shared onto her Save Samantha Facebook "Bursting with thanks & pride for dad and everyone involved yesterday. It’s taken everything out of me, so I’ll write the message that it deserves as soon as I’m able ❤️"
We are awaiting the fundraising total from the day and will share on our Save Samantha Facebook page soon. October is Social #SaveSamantha and we have held our first event already! Our Save Samantha community are virtually coming together to hit the next mile stone of fundraising. 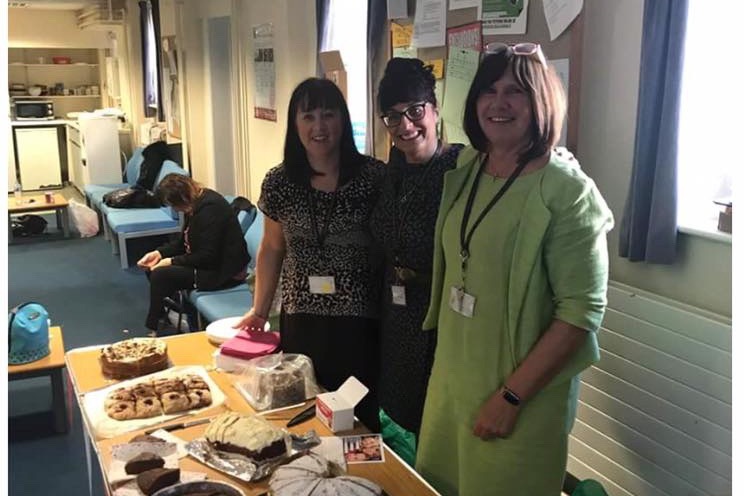 A massive thank you to Wendy and the staff at Crompton House C of E school who held the very first Social for Sam today and raised an impressive £62!! Well done ladies! The cakes looked delicious. If anyone would like more information or a fundraiser pack for £5 to host your own event please hit reply to this email. Event ideas include coffee mornings, wine tasting, beer tasting & Halloween parties! Do you get our regular updates on our Facebook?